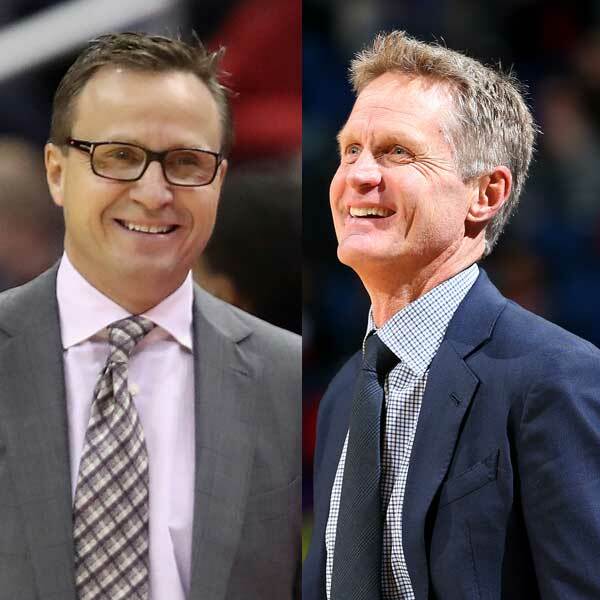 NEW YORK — The Washington Wizards’ Scott Brooks and the Golden State Warriors’ Steve Kerr today were named the NBA Eastern and Western Conference Coaches of the Month, respectively, for games played in January. Brooks guided Washington to an Eastern Conference-best 12-4 record during January as the Wizards climbed into a tie for first place in the Southeast Division. Washington went 7-0 at Verizon Center to extend its home winning streak to 15 games, tied for the second-longest run in franchise history. The Wizards closed the month on a five-game winning streak, which included victories over the current Atlantic Division leader, the Boston Celtics, and the Southeast co-leader, the Atlanta Hawks. Brooks’ team held opponents to 43.4 percent shooting from the field, the best mark in the NBA. Kerr led the Warriors to an NBA-best 12-2 record in January, with Golden State losing to the Memphis Grizzlies in overtime and falling to the Miami Heat after Miami guard Dion Waiters made a tiebreaking three-pointer with 0.6 seconds left. The Warriors led the NBA in scoring (120.3 ppg), assists (30.6 apg), field goal percentage (50.9) and point differential (14.1) for the month, which included wins over the East-leading Cleveland Cavaliers, the Houston Rockets and the LA Clippers. On Jan. 23, Kerr and his staff earned the honor to coach the Western Conference All-Stars in the 2017 NBA All-Star Game after clinching the best record in the conference through games played on Sunday, Feb. 5. Other nominees for the NBA Eastern and Western Conference Coaches of the Month were Atlanta’s Mike Budenholzer, Boston’s Brad Stevens, Indiana’s Nate McMillan, the LA Clippers’ Doc Rivers, Miami’s Erik Spoelstra and Philadelphia’s Brett Brown.